She has been spotted over the past few days puffing on a suspicious looking cigarette during her Hawaiian holiday. And yesterday Rihanna appeared to clear up exactly what she has been smoking by quoting some lyrics from rapper Drake's song Up All Night on her Twitter page. She wrote: 'Kush rolled, glass full... I prefer the better things!' Kush refers to a type of cannabis found mainly in Afghanistan, Pakistan and India. The singer, who features in a new Armani campaign, seemed pensive as she waded out into the sea in a skin-tight hot pink dress, which she was wearing over a green and black bikini. She splashed around in knee-deep water while clutching the hand-rolled cigarette, after taking a walk earlier in the day. The brown papered roll-up looked remarkably similar to a 'blunt', which is slang for a marijuana filled cigar. The type favoured and popularised in hip-hop music. In 2008, a ballot was passed in Hawaii which made possession of marijuana the lowest priority for law enforcement. This means that under this county code, adults over the age of 21 are allowed to possess up to 24 plants or 24 ounces of marijuana on private property. In public, the possession of less than one ounce of marijuana is classed as a misdemeanour offence, which can be punished by a fine of up to $1,000 and 30 days in jail. Possession of one ounce or more can be punished by a fine of up to $2,000 and up to one year in prison. While some people undoubtedly just smoke the cigars, Rihanna did look rather laidback over the weekend as she lolled on her sunlounger. Rihanna looked blissful and deep in thought while taking a private moment for herself. The singer has been quite vocal on her Twitter page recently, telling fans how she has been enjoying her time off. 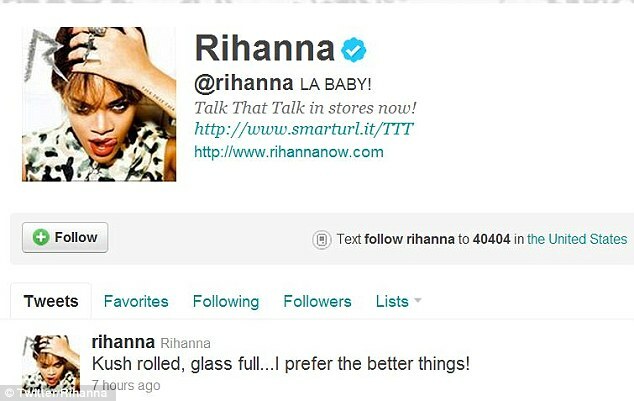 Earlier on in the week the Rihanna tweeted: '4:20...Hi.' The figure 4.20 is another slang term for marijuana. The Umbrella singer was enjoying the Hawaiian sunshine on Sunday. Her face free of make-up, she looked totally at ease wearing black leggings and a hot pink vest top. The barefoot singer sat on a sun lounger and puffed away before lying back and taking in the scenery. It's been a relaxing few weeks for the singer from Barbados. She jetted into Hawaii at the weekend after spending a few days in Los Angeles, where she was seen sitting court side at a couple of basketball games. Two weeks ago the Good Girl Gone Bad welcomed the New Year in Miami with P Diddy.